Sydney Nguyen is a junior political science major who is an intern in the mayor's office and who has been active in voter registration drives. Whether it's studying political science with a 3.79 GPA, interning in the Mayor's office, learning about how to overturn a death row sentence or playing on the intramural volleyball team – Sydney Nguyen pursues politics every way she can. Nguyen has worked this semester with the Hobby Center for Public Policy to register voters and increase awareness of the issues in this election. "I don't think politics is boring," Nguyen said. "I think it's just that it's not the first priority for students. I think people have so many things to do first, so they always push it back. I was like that, too, so I purposely took courses and made political science my major so I could be more informed." While there are numerous possible reasons why citizens don't vote, it is likely they are unaware of how their lives are affected by elected officials and their policies. Dr. Martin Luther King preached, "We are caught in an inescapable network of mutuality, tied in a single garment of destiny. Whatever affects one directly, affects all indirectly." This means that everyone's lives are intertwined. Policies, good or bad, affect some directly and others indirectly. Voting guarantees citizens the opportunity to advocate for policies that will lead to a better world, instead of depending on the will of others to make good choices. Voting preserves a citizen's rights and provides a means for each individual to contribute to society by influencing the passage of the best policies. While men and women arduously campaigned to gain the right to vote in the past, many citizens today don't vote. Voting is a right and a responsibility. It is one's right to vote for what one supports. It is one's responsibility to build a better community by voting for good policies and leaders. All citizens should exercise their right and civic duty to build a greater nation. And through UH's Civic Houston Internship Program (CHIP), Nguyen gets an inside perspective on how the City of Houston turns politics into policy. "I don't know how I would have been able to be an intern in the mayor's office if I hadn't applied (to CHIP)," she said. "There's just so many opportunities out there and our school gives great scholarships." Nguyen, a junior political science major from Pasadena who is also pursuing minors in Spanish and the Honors College's Phronesis: Politics and Ethics program, said she plans on graduating in 2013 and entering law school. Her eventual goal is to open a law firm that would serve low-income immigrant families. "My private practice would take care of common necessities, such as immigration papers, taxes, citizenship and so on," Nguyen said. This summer, Nguyen helped the Vietnamese Culture and Science Association honor valedictorians and salutatorians of Vietnamese descent from local high schools. 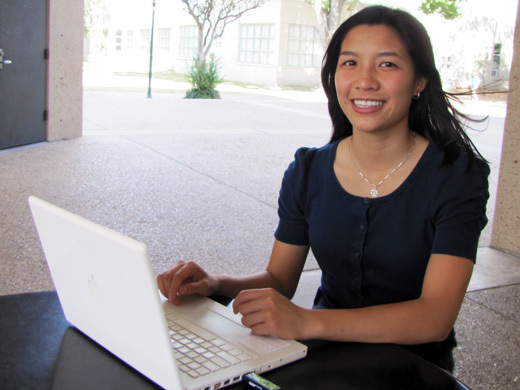 "I also helped translate about 25 student biographies from English to Vietnamese," Nguyen said. "Once I became more involved and got to know the members better, I was so grateful I decided to help. I gained so many great friends who are all so talented." Nguyen said her favorite thing about UH is its Campus Recreation and Fitness Center. That's where she puts her political skills to a physical test. I joined the intramural volleyball team this semester, and we've won all of our games so far," Nguyen said. Earlier this year, Nguyen participated in the month-long Summer Prelaw Institute at the UH Law Center, where she said she developed an interest in criminal law. There, she attended a course taught by University of St. Thomas journalism professor and local attorney Nicole Casarez. Casarez told Nguyen and the rest of the class about the death row case of Anthony Graves, which she worked to overturn with her St. Thomas journalism class and The Innocence Project at the University of Houston. On Oct. 20, Casarez returned to the UH campus to speak about the Graves case, and Nguyen attended the event. "She told us that she was hopeful of Graves' release but did not want to get her hopes smothered like the other times before," Nguyen said. "Professor Casarez showed us a video of Graves and he was able to maintain such a positive demeanor, even in his current situation. Professor Casarez revealed that while she is the one defending him, he is the one keeping her strong." Graves was released from jail on Oct. 27 after serving 18 years in prison. Graves was convicted of the 1992 killing a family in Somerville he has maintained he did not know.